Ancient Egypt was a male-dominated society. The head of the government, the Pharaoh, was the most powerful man on earth during much of the Egyptian Empire’s existence. He was symbolized by a cobra and led the army in times of war, a god leading his men into combat. This was not a place for women; few had the wherewithal to attempt to take such a position much less aspire to hold on to it. Some women managed to take the throne for a few years in Ancient Egypt, often just until a husband could be found or a male heir was old enough to take her place. But one woman stands out, a powerful and intelligent ruler whose reign spanned nearly 22 years: Queen Hatshepsut. Hatshepsut was born to the much beloved Pharaoh Tuthmosis I and his primary queen. When the Pharaoh died, his only son and namesake was one born to a minor wife. In order to strengthen the claim to the throne for the young man and keep the royal bloodline pure, he was married to his half-sister Hatshepsut. Such couplings were quite common in Ancient Egypt for these reasons. Tuthmosis II’s 14-year rule was uneventful. Although no great disasters befell the Empire during the period, Tuthmosis II did not enjoy the people’s favor as his father had. Like his father, Tuthmosis II had one son but by a minor wife. When Tuthmosis II died, however, his son was still a child, incapable of running the country. Hatshepsut declared herself regent for the boy. Again, this was common practice, even for women. She was the blood of Tuthmosis I and the Queen for Tuthmosis II, so she was in a powerful position. She was the obvious choice to lead the country until the next male, Tuthmosis III, was mature enough to take over. But Hatshepsut refused to give back the reins of power to her stepson. It’s unclear exactly when, but somewhere around year 7 of her reign, Tuthmosis III should have been old enough to become Pharaoh in his own right. Instead of seeing his name replacing hers, however, we see new titles being bestowed to Hatshepsut such as “Horus Wosretkau” (King of Upper and Lower Egypt). A new mythology is created about how she was actually crowned by her own father and spreads throughout the Empire. And new statuary is created that depicts her in full kingly regalia, including the false beard. One of the reasons Hatshepsut was able to pull off her coup was that she was apparently a good leader. Trade routes that had been disrupted during the chaos of the Second Intermediate Period were re-established. Military campaigns were successful. A large portion of her reign was peaceful. Many monuments, buildings and statuary were commissioned, a nod to the prosperity at the time. Hatshepsut’s mortuary temple at Deir el-Bahari is considered one of the most outstanding examples of Ancient Egyptian architecture. The military was kept busy during the bulk of Hatshepsut’s reign, and that appears to be where the youngest Tuthmosis spent his time. Had Hatshepsut been a poor ruler that the people wanted ousted, Tuthmosis III certainly had the backing of the army and should have been able to take her out. However, it wasn’t until her death after a reign of over 20 years that her stepson finally came to full power. Such a situation lends itself to questions about Hatshepsut’s death, especially given the aftermath. 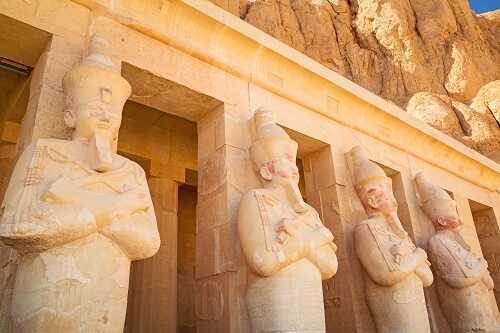 Most of Hatshepsut’s monuments as well as those close to her were destroyed or rewritten. Her name was erased from cartouches and replaced with that of Tuthmosis. It was an attempt to erase her from Ancient Egyptian history, to pretend she had never existed. The motive for the destruction doesn’t appear to be incompetence on the throne, so it seems it must be her insistence on bucking tradition, the simple fact that she was a female pharaoh, that brought such ire after her death. Is her death suspicious then, as well? Tuthmosis III certainly would have had reason to resent her. She showed no signs of being willing to hand over the throne to him, the true heir according to Ancient Egyptian tradition. The demolition of so many of her artifacts is testament to his anger. Or is it? Items were indeed destroyed, changed, or hidden away, but this revision of history didn’t occur until 20 years after her death. Had Tuthmosis III really hated Hatshepsut, especially hated her enough and been ambitious enough to kill her, it seems unreasonable that he would wait so long before attempting to eliminate her from history. Regardless of Tuthmosis’ motives and actions, Hatshepsut’s name has survived to modern times, and she stands out as a powerful woman in history, one of the few women in Ancient Egypt to grab and retain leadership for a significant length of time. Ironically, Tuthmosis’ actions to hide her from posterity may have actually illuminated her accomplishments even more so. But then again, maybe he wouldn’t have minded that.